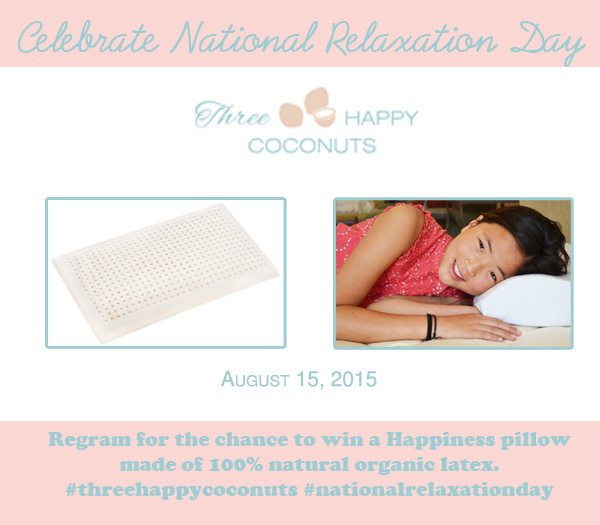 Celebrate National Relaxation Day (August 15th)! 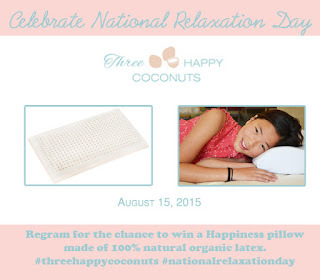 Celebrate National Relaxation Day, August 15th, by entering Three Happy Coconuts blissful contest to receive a Three Happy Coconuts Happiness 100% pure organic latex pillow. No more sleepless nights thinking your health is being affected by harmful gasses and chemicals! To enter, complete these rules by August 14th 5:00 pm Pacific Time. 3. Tag 3 friends in the re-gram. Happiness is one of two hypoallergenic pillows made of pure organic latex for kids and adults suffering from allergies and asthma, and anyone who needs a chemical-free alternative to traditional cotton or wool pillows. Happiness (retail $100-120, standard & queen) comes in a traditional pillow shape, while Delight (retail $80-100, standard & queen) contours the shape of the head and neck. Both pillows provide excellent head and neck support, while providing ventilation due to the strategic placement of air holes. 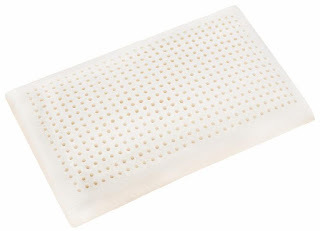 Neither pillow retains heat or moisture, so they remain cool, dry, mold- and bacteria-free even in hot and humid environments. Palmpring derives its 100% natural latex from organic rubber trees in India, where the natural rubber is extracted over a period of months and then transformed into high-density foam using natural resin without the use of chemicals. "The advantage here is that there is no off-gassing from natural latex foam so no chemicals are being released into the air or touching the body," Kim says. Tests of the latex have demonstrated that water drips straight through this natural material and is not retained. The accumulation of sweat leads to the growth of dust mites, which may consequently lead to various allergies and other respiratory problems. Three Happy Coconuts is a newly founded Los Angeles-based organic bedding company founded by mom entrepreneur Camilla Kim. Kim founded the company out of concern for her two young daughters' health, and her strong belief that they should not be at risk while sleeping. The collection, which includes plush mattresses, pillow toppers and pillows for kids and adults, represents her company's key values: family, comfort, and safety in the certified organic materials. Three Happy Coconuts' collection includes: mattreses, pillows, pillow topper, crib bed, and adjustable bed. The products use certified organic materials throughout, not just in the exterior components. "This means our cotton, wool, natural latex and coconut fibers each have certifications, plus involve sustainable production," says Kim. "And we do not use any synthetic materials, so there is nothing to fear in regards to toxicity, or metal springs emitting electro magnetic fields." To learn more about Three Happy Coconuts click HERE. How in the heck to you re-gram something? I've tried for the last 20 minutes and now I give up. Instagram is terrible. You can download the regram app at the App Store. That's what I use. I had no idea that stuff like this existed! It's wonderful to find products that help people with allergies! So many great products on the market now for those suffering from allergies. I'm so picky about my pillows, but this one looks wonderful. I don't Instagram but what a fun name. Wish you well. Oh what a wonderful way to relax. I love that this pillow is organic and free from chemicals. It does make you rest easy knowing your not being exposed to toxins where you rest your head every night. Great Giveaway! This sounds like a very relaxing pillow. I like that it's a small, American based company as well.